Though fast food is quick, easy, and often tastes good, it tends to be high in fat and sugar and low in fibre. It’s fine as an occasional treat, but there are alternatives that don’t take long to prepare, and taste great (see also Kicking a Junk Food Habit). Sandwiches are cheap, filling and tasty, and can contain pretty much anything, savoury or sweet, from egg and bacon for breakfast to cheese and pickle for lunch and ham salad for supper, followed by apple and cinnamon or mashed banana for pudding. Use fresh wholemeal, granary, seeded or fruit bread to add extra flavour (and extra fibre). Home-made burgers are easy to make – mix lean beef, pork or lamb mince together with a beaten egg, breadcrumbs and finely chopped onions, with spices, herbs or other flavours to taste (apple works really well with pork), and then grill until cooked through and serve in wholemeal rolls with plenty of salad. To make fast vegetarian, meat or seafood pizzas, spread tomato puree or pasta sauce over a slice of wholemeal bread or a wholemeal pitta bread, then top with whatever looks good – sliced peppers, sweet corn, sliced tomatoes, tuna, pepperoni, mozzarella, cooked chicken, cooked bacon – and grill until the pizza is hot and the cheese is bubbling. Sometimes there’s nothing like chips or potato wedges, but they are usually very high fat. Cut potatoes into wedges or chips, parboil them for a few minutes, drain them thoroughly (shaking a little to roughen up the edges) and spread them on a baking tray. Coat the chips or wedges lightly with spray oil, sprinkle on herbs or spices for extra flavour and bake at 240C, 475F or gas mark 9 for 20 to 25 minutes or until crispy and cooked through). To make healthy fish or chicken nuggets to go with the chips, dip the fish fillet or bite size pieces of chicken in beaten egg, roll in breadcrumbs and bake for 15 to 20 minutes or until cooked through at 240C, 475F or gas mark 9. 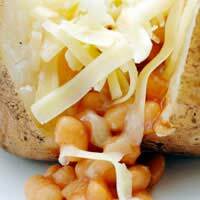 Baked potatoes from the oven (200C, 400F or gas mark 6 for up to one and a half hours) have wonderful crispy skins, but for a truly fast bit of food, cook a potato (prick the skin first) for about five to eight minutes (depends on the size of the potato and the power of the microwave). Serve with baked beans, sweet corn, cottage cheese, cheese, or just a little bit of butter and some black pepper. Fruit, fresh or dried, is the original fast food – it comes in its own package of skin, and pots of plain yogurt (or homemade yogurt) with dried fruit, honey or nuts stirred in make a healthy and naturally sweet pudding. For something a bit more interesting, pour the mixture into a plastic cup, add a lolly stick and freeze for a healthy ice cream on a stick.